It reminds me of some words given to me at a teashop to basically the same effect. The truth is, I love to read; I don’t think book knowledge compares to hands-on experience to any extent, but it also doesn’t hinder it (unless you stubbornly choose to let it). I don’t read to the exclusion of tea drinking, but because I enjoy it and because it gives me something just drinking alone can’t. Roy Fong’s book is short and sweet, and is basically as-advertised. 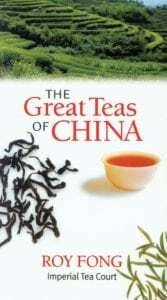 A brief look into some of the author’s favourite Chinese teas. It’s not as in-depth as say the tasting handbooks you can pick up, but does offer a brief summary and a lot of useful information. The teas are organized by type (starting with White and ending with Puerh); Roy introduces them by transliterated name, followed by either the translation or “common” name (whatever is better known). After a brief history of the tea, the book focuses on its production (with intermittent short stories about how Fong came to encounter the tea done in yellow boxes), and occasionally some tasting notes. The entire puerh section is a bit confusingly written, so that I had to read the entire section twice (at first it seemed like he was saying shou puer doesn’t exist; the section could probably use a rewrite). After the bulk of the book is a Preparation Guide, followed by a Glossary. The prep guide covers common utensils (gaiwan, yixing pot), and a rule-of-thumb for water temperature and time. The glossary is useful, and covers again all the terms used and defined in the book itself, neatly organized. I found myself copying a few terms down. One of the interesting things that caught me off-guard is that, while describing Qi Men, Fong mentions that it can be made as far away as Jiangxi Province–similar to what I thought was a mistake in World Atlas of Tea. However, he takes the time to actually explain this, whereas Atlas of Tea vaguely lists ‘Keemun’ under both provinces, and then under the ‘Keemun’ section only mentions it as being produced in Anhui. Coincidental mistake? Intentional? I don’t know. If so, it was explained very poorly (ie not at all). Fong meanwhile covers its history and both common romanizations: qi men and keemun. Overall, for a read, I like the book; I’d probably keep it on-hand for reference as well, but I’m sure most typical brewing guides cover the teas to about the same amount of depth as this one, as well as covering a multitude of other teas. Still, of the guides I’ve scanned, most don’t mention cultivar and production seasons, grading and quality like this one does, but when you’re only covering a brief few teas, you have a little more space to work with. I learned a thing or two. You should rate the different guides you read. I’ve thought about it. I think comparing guides to each other, by rating what they cover and how many teas/countries they cover. Likely with a handy, very large spreadsheet.